Pictured left to right are Lions Club President Sharon Rose, Gordon Patty, and Lions Program Chair Dee Smith. 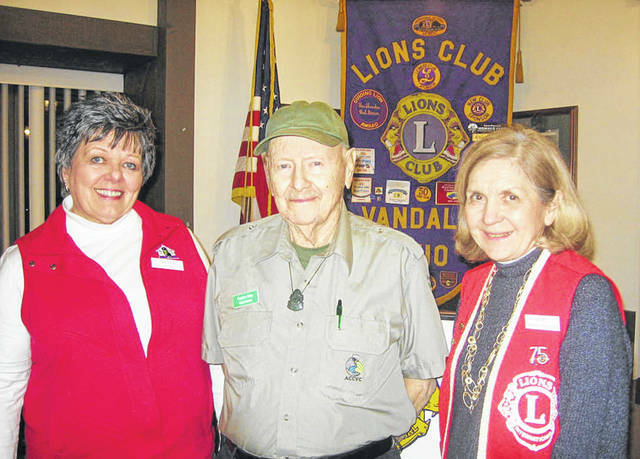 VANDALIA —Gordon Patty, who resides at Friendship Village, spoke at the January 10 dinner meeting of the Vandalia Lions Club. He has done extensive traveling and written a book titled “Without Borders.” His topic for the Lions was the country of Costa Rica. Based on an opportunity offered by Costa Rica for park workers, he has been going there for the last 25 years and has been involved in many park projects. One took nine months building a Nature Center. Many of their parks include rain forests, and one of the on-going projects is getting the youth out of the forests and into schools. Some have progressed to the college level by use of the internet. He provided some basic statistics: Costa Rica’s population is approximately 5 million and is about the size of West Virginia, with a per-capita income of $15,000, compared to their poor neighbor to the north, Nicaragua, which has per capita income of $2,500. Tourism is the main source of income. They export coffee, bananas, flowers, and baseballs for Major League Baseball. San Juan is the capital with approximately 1 million people. They are a very “laid-back” people with no Army, preventative medicine, few worries, with many people in one area living to the age of 110. Visitors are advised not to travel by car, since their roads and drivers are poor, but bus service is good.